In the annals of Indian handloom saree, Shantipur and Fulia are a name to reckon with. Their fascinating story is also in a nutshell the story of Bengal handloom sarees. The geographical twins could not be more different. The first, a handloom weaving centre over 500 years old. The second came to flourish only after Partition. Yet, their destinies are linked together – the Shantipur and Fulia saree swim or sink with the success or otherwise of Bengal handloom. There are records of handloom saree weaving activity in Shantipur, a centre of Vaishnavite culture and Bhakti movement, as early as the 15th century. Weaving flourished throughout the medieval era, and the famed indigo-dyed Neelambari made the Shantipur saree a household name. There was a strong sense of identity among Shantipur weavers. They united to agitate against the stranglehold of the Dadni system of the British East India Company and even took their grievances to colonial courts during the19th century. In the decades leading up to independence, Shantipur saw gradual inflow of techniques like the Barrel Dobby facilitating the conversion from Throw Shuttle to Fly Shuttle (1920s), the Jacquard Machine (1930s), and sectional warping and sizing that allowed production of warp yarns 350 yards long (1930s). The demographics of Shantipur region went through a sea-change after Partition. Hindu weavers fleeing the erstwhile East Pakistan (now Bangladesh) settled down in large numbers in a concentrated area on either side of the Ganga in Nadia and Burdwan districts of South Bengal. A considerable number among them settled in Fulia, neighbouring Shantipur. Fulia is now uttered in the same breath as Shantipur. Weavers there trace their lineage to the great Bengal handloom saree weaving centre of Tangail near Dhaka (Bangladesh). They have evolved their own weaving style called Fulia Tangail. The USP of the Neelambari lay in the fineness of the yarn and dyeing quality. Very fine hand spun yarn of 250 – 300 s was used for weaving, resulting in a powder fine texture. A heady mix of fine weaving and subtlety of design, the Neelambari was the last word in sophistication. Today traditional handloom sarees woven in Shantipur have 68s to 80s counts cotton yarn in the warp and the weft. Cotton and silk yarn is used as extra warp in the border, and so is zari. 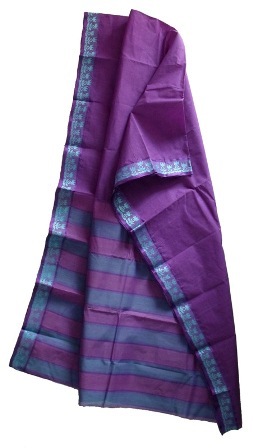 There is also the “do- rookha” technique of weaving double sided design, where the saree looks the same on either side. Another unique feature of Shantipur sarees is the finishing. The weavers here apply size paste (made from sago or popped rice) once while sizing the warp yarn and again, either by hand when the saree is still being woven or by fixing the saree to a frame after weaving is complete. Weavers of Tangail, near Dhaka in modern Bangladesh, were famous for the incomparable Dhakai Jamdani saree. After Partition, the majority of these weavers immigrated to West Bengal, a large number settling down at Fulia with government patronage. Fulia weavers added a new jest to the handloom weaving scenario in Shantipur region. They developed their own version of the Dhakai, called ‘Tangail Jamdani,’ and a combination of Shantipur and Tangail styles called the ‘Fulia Tangail’. The Tangail Jamdani is similar to the Dhakai Jamdani in that it uses interlocking extra weft cotton yarn to produce floral or geometric motifs. However, it has a softer feel and sparser distribution of motifs. The Fulia Tangail incorporates vibrant colours and large, intricate designs woven in double jacquard. These sarees are also being woven in mulberry and tassar silk apart from cotton. 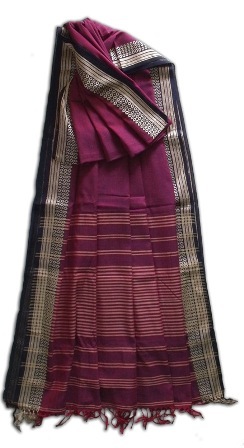 Traditional Jamdani, the pride of Bengal handloom, is now woven in Habibpur and Ramchandrapur near Fulia. The true Jamdani saree is woven without using even a jacquard machine. The weaver uses fine needle-like spindles to conjure magic with extra weft work that can rival the most intricate embroidery. Shantipur and its adjoining areas had a tradition of fine muslin yardage weaving, with 600 s yarns being used. However, at present there is no major muslin weaving activity in Shantipur. The finest muslins are now woven in Kalna, across the Ganga. It’s not that the Bengal handloom saree weavers of Shantipur and Fulia have remained confined in a time warp. A number of innovations in techniques and products have taken weaving in the region to the next level. Read all about it in the upcoming post!